Opened in 1989, DANS at Green Hills is Reading"s premier fine dining establishment. 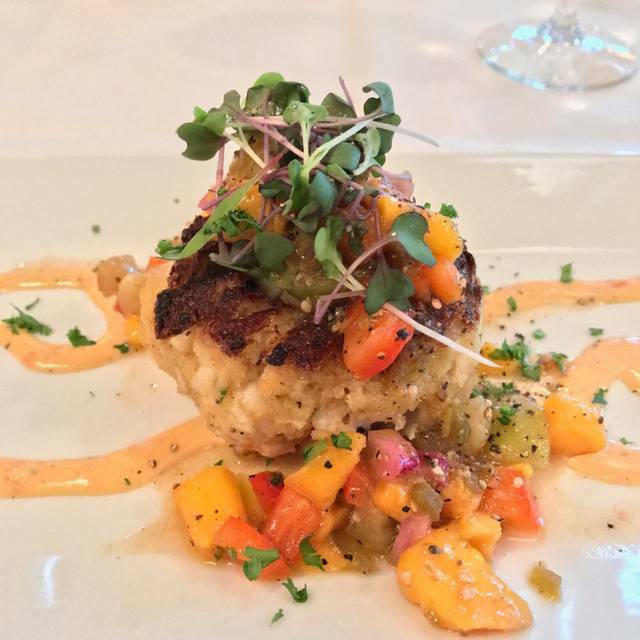 DANS at Green Hills serves a contemporary American cuisine with a French influence. 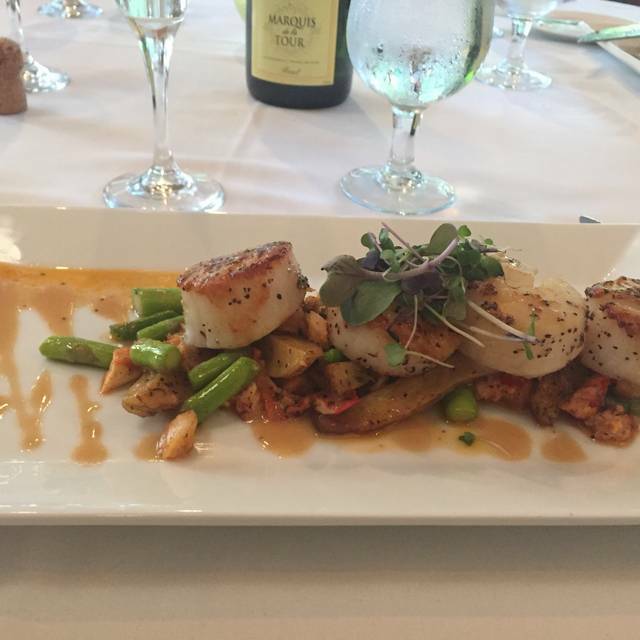 Our goal is to provide a fine dining experience that is an alternative to the traditional Berks County scene. Great meal as usual...prix fixe menu for Easter Sunday. Good selection and usual exemplary service. This is our favorite place to go for a special occasion. I have yet to find a better place in Berks County! Everything about it is great!! Love it here and can’t wait for our next visit! First visit to Dan's for a family occasion with 5 diners - service was attentive without being fussy, every dish was tasty, beautifully presented and well conceived. Wine list consists of rather mundane low-end offerings and quite a few very high priced bottles but little of interest in between. Generally nice ambiance in the main rooms, but the back room (which has nice windows) suffered from being very reverberant (high wood ceiling and stuccoed walls) so conversation was difficult above the haze of sound (and those at other tables were not speaking particularly loudly). Will definitely return, but ask for seating in the main part of the building which has a warmer atmosphere and is also presumably quieter. Excellent food and atmosphere. My wife and I travel to the area once a year and Dan's is on our list of places to eat every time. Great food & service. Can't wait to go back & sit on the patio in the summer. Great food! Great service! This will be our new go to fine dinning place! Excellent all around dining experience. This is our go to place for special occasions and this evening did not disappoint. Excellent service and food to match. A very nice cozy and refined place we just discovered. Menu with a French influence. The Harvest salad was fresh and generous. My petit Filet Mignon was perfectly prepared. My husband had the Seafood Ravioli appetizer with a nicely spiced sauce and the Salmon which was equally as good. Impeccable service with a very nice ambiance. Located close to our home so we will definitely return. We were seated in the garden room by the door. Of course two women would be given one of the worst tables! No ambiance in that room. The food was average and expensive. We cook better food at home. Will not be going back! We have never been disappointed at Dans. Always consistent and always great! The food is fantastic and the staff is always so nice. My wife and I love Dan’s. They treat us like family and the food never disappoints. We usually go 3-5 times a year for occasions like a date night, etc. The staff is great and the value proposition for a fine dining establishment is excellent. After relocating to PA, I've driven past this little gem countless times. I recall the first time I saw it, I wasn't sure what it was. from the road it looks like a house. And the business sign sort of gives you the feel that it's a golf pro shop. None-the-less, at the urging of some locals, I hesitantly made a reservations for me and my wife for our anniversary. Wow! We were a little early so we started off with drinks in their quaint bar. And by quaint, I mean small....really small. But it was an absolute gas. There were a variety of locals and travelers that we were able to socialize with and it was...well....fun. We were seated at a nice corner table. Apps were delivered on time and were great. I had the crab cake. She had the lobster bisque. For dinner I had the 10oz filet. Now I've had lots of steaks from just about every level of restaurant you can imagine. This was a top 3....ever. It was tender and flavorful and charred perfectly. Amazing. She had the surf and turf. She was less impressed with hers but still it was very good. We skipped desert so I can't comment. But this was a great little place for the service, the food, and the ambience. Don't miss it! Great quiet romantic place. Food was good! Only thing I would change is to cover up the window with a shear that looks in from the hostess table to the dining area. We had the table right there and it was annoying seeing people looking in the window - killed the mood a little. Other than that very much enjoyed it for our Anniversary. Quality of food and service was excellent as always, Dan’s continues to be a favorite for my wife and me. What a delightful experience at Dan's! We have not had a bad meal there!! My wife and I had one of the most enjoyable nights out in a long time. The food and service was exceptional however the guests we were seated next to added that something special to the night. Where as other establishments are fine. We were able to strike up an intelligent and amusing conversation with the couples at both sides of our table. In fact we were having such a great time that staff even participated in some on our friendly banter. I believe (speaking for the other couples) we all enjoyed our evening immensely. This was one evening both my wife and I truly cherished. Thank you Dan's at Green Hills. Outstanding as usual! This place sets the bar as far as service and food quality. My wife and I came here for Valentine's day and it was impeccable. I had the filet and my wife had the chicken penne pasta which she thoroughly enjoyed. I had the filet which was perfectly cooked and delicious. We will continue to come here for special occasions! Love Dan's Restaurant. Seems its time for some changes in menu. Still the food was good and the service, too. 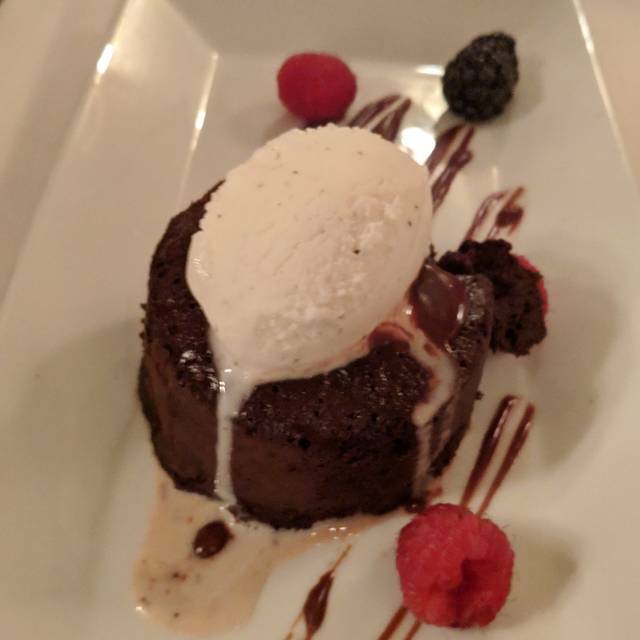 Dan's is our go to place for special occasions. It is obvious that Bill and Monir put their heart and soul into the ambiance, service and food. You will never be disappointed. Best fine dining in the area. Owners are very nice people who greet you upon arrival and stop by your table for a moment to chat. Food is excellent. Service is friendly and professional. There are two well executed, beautifully maintained, dining rooms and an attractive outside patio. Good for special occasions, Dan's also has lots of regulars. 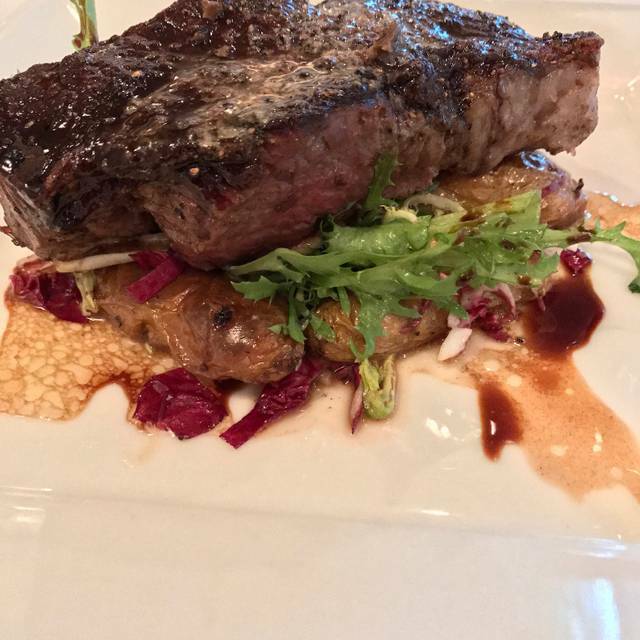 The service at Dan’s is top-notch, and the menu is authentic and quite tasty. While on its surface, Dans didn’t look like a place we would have one of the best meals we would have in a long time, once we got our food, we were blown away. Every dish we had was amazing. Their sweet potato soup, filet mignon, homemade ravioli, basically everything we had, was delicious. Would definitely recommend if in the Reading, PA area. Great food , wonderful service, comfortable atmosphere! Overall food was delicious. Would recommend serving warm tasty bread/rolls. Rolls were cold, small and hard. Service was very good. Would recommend Dan’s.. nice ambiance near the fireplace.. Simply delightful and our dinner was superior. Another excellent experience at Dan’s. We often bring my in-laws here for dinner when they visit. The food has always been perfectly prepared, with thought given to the marrying of flavors in the dishes. This time, my Mother-In-Law stayed that Dan’s is her favorite Reading Area restaurant! Went here for a Christmas family get together. Very special and memorable. Escargot was exquisite. Filet mignon did not disappoint, neither did the lamb. Sweet potato was soooo good according to my daughter. Also thought I lost my glasses there, called, and they were ready and willing to mail them to me! Very accommodating. The food and service were fantastic. It was a great holiday treat. The warm fireplace room welcomed the tree of us on a chilly rainy night. The “busy restaurant buzz” and graciously spaced tables gave that Niue sense and of being in a friendly room and a sense and table privacy. A delightful amuse bouche closely followed the Rhône red. Our friend had a long trip after the meal and in conversation during our ordering mentioned that she would need coffee. Coffee appeared within minutes. The service was prompt, informative and paced to our leisurely dining style. The appetizers of escargot (classic preparation superbly done) and a wild mushroom soup that was rich flavored with a depth of nuanced mushroom flavors. 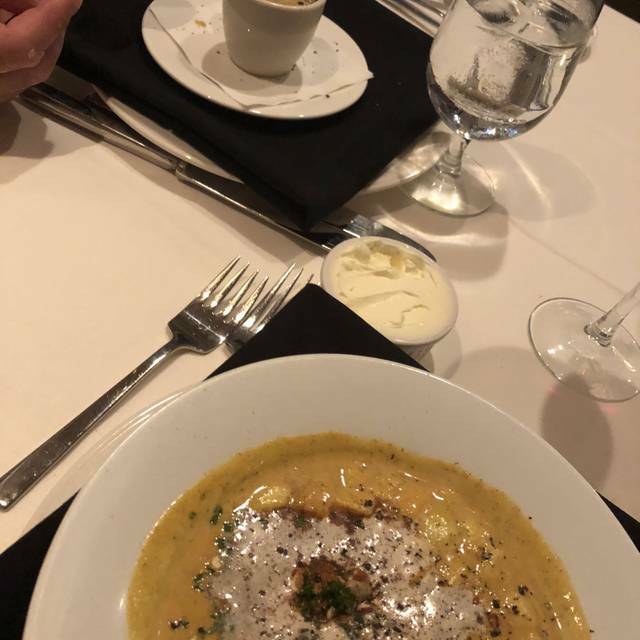 Our guest did not order an appetizer but was presented with a complimentary cup of exquisite squash soup. 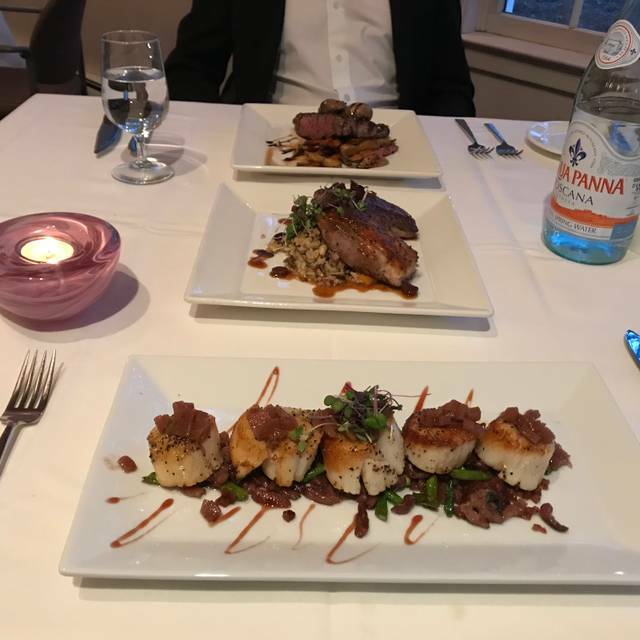 Entrées of filet, duck breast, and salmon lived up to the outstanding appetizers in presentation, palatal range and balance, and satisfactory size. The extensive wine list is well balanced in variety and price and well selected for quality. The whole dining experience was delightful. 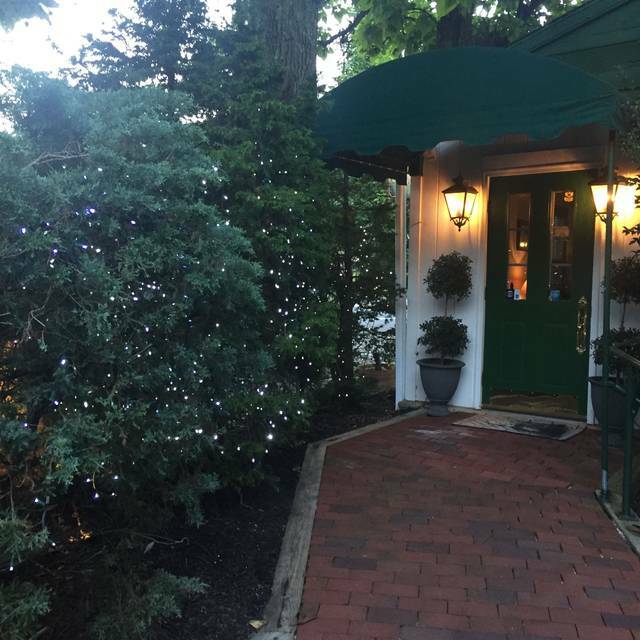 Dan's is a beautiful place for a quiet dinner with excellent food and warm, attentive service. It’s our favor place to dine. This is a wonderful restaurant. We have been here many times. They have a wonderful patio which we have utilized in the summertime. They also have a great Happy Hour, bar seats only, with excellent Happy Hour food. I love their escargot. This is fine dining at its best but also great for a quick bit before an event. We will continue to go here time and time again. Fabulous presentation!!! Excellent service. Scrumptious food!!! Wonderful! Delicious meal, attentive service. Was a very nice night out. The food was amazing and the wait staff was very professional. It’s a little expensive but you get what you pay for with good portions of food.